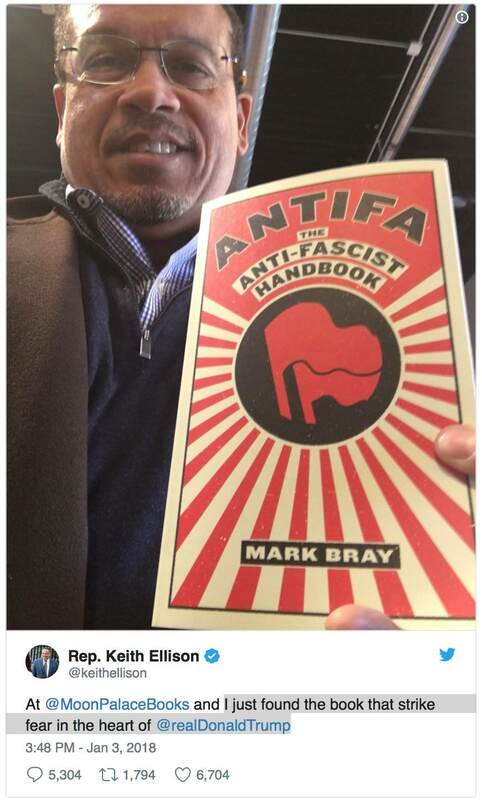 Thursday evening, an unbylined Associated Press item finally recognized the existence of Democratic National Committee Deputy Chair Keith Ellison's tweet taunting President Trump with a violence-advocating "antifa" book accompanied by a grammar-challenged message: “I just found the book that strike fear in the heart of @realDonaldTrump." The obvious purpose of the gatekeeping wire service's piece was to tell the rest of the establishment press: "There's nothing to see here." Ellison is also a six-term congressman representing Minnesota's 5th District, and was considered the front-runner to become DNC Chair in early 2017. However, allies of Barack Obama and other Democrats concerned about some of the Congressman's previous comments, particularly a 2010 speech where he, per NPR, questioned the "value of the United States focusing so much of its Middle Eastern foreign policy on support for Israel" — in Ellison's words, how that policy "is governed by what is good or bad through a country of 7 million people" out of "a region of 350 million" — opposed him. Instead, Democrats ultimately picked former Labor Secretary Tom Perez. In a conciliatory gesture, Perez promptly named Ellison to the not officially recognized position of Deputy Chair. What follows will address the green-underlined text first, and then each red item sequentially. In the green-underlined item, note how the unnamed AP reporter spared Ellison embarrassment for his failure to construct a complete sentence, and then assumed that the congressman meant to write "should strike." It's at least as likely, if not moreso given his background (more on that later), that Ellison meant to write "will strike," or simply forgot to add the "s" in "strikes" (which would mean that he somehow believes that it's an established fact that the book scares Trump). The first two red-underlined items directly contradict each other. More background on Bray is at a Thursday morning post at my home blog. His background goes back to the violent 2011-2012 Occupy movement, particularly the New York City-based Occupy Wall Street. As I noted on Thursday, "Bray’s previous association with Occupy and his Antifa book confirm that violence has been and continues to be an inherent part of the far-left's/anarchists’ modus operandi." The author of “Antifa: The Anti-Fascist Handbook” made waves during an Aug. 20 interview on “Meet the Press” in which he framed the physically confrontational tactics of black-clad collectivists as “confronting other forms of violence.” His employer (Dartmouth College) distanced itself from his statements, but Mr. Bray stands by his words. Also, AP — and antifa itself, which also continues to hide behind this lie — needs to spare the nation the contention that their violence only targets "speaking engagements and white-supremacist rallies." AP passive-aggressively implied (with plausible deniability, thanks to vagueness) that the "speaking engagements" only involve "white supremacists" by not describing those speeches further. The fact is that antifa is responsible, at the very least, for cancelled speeches at the University of California in Berkeley by non-fascists Ann Coulter and Milo Yiannopoulos, who also claims partial Jewish descent. As to what kind of rallies antifa targets, it has called for and carried out violence at events involving Donald Trump, both during his campaign for the presidency and after he was elected and inaugurated. In June of last year, demonstrators—at least some of whom were associated with antifa—punched and threw eggs at people exiting a Trump rally in San Jose, California. Antifa was also heavily involved in anti-Trump Inauguration Day violence, which included smashing obviously non-fascist inanimate objects like storefront windows, cars, and limousines. Peter Beinart's Atlantic piece also noted and highlighted the point that "Antifa's tactics have elicited substantial support from the mainstream left." This clearly includes DNC Deputy Chair Ellison. TUCKER CARLSON: Keith Ellison believes Bray's work is admirable. He said so. Now if you're shocked by this, you haven't followed Ellison's career for very long. He has a long history of saying repugnant things and backing extremist causes. Back in 1989, Ellison wrote that the Constitution existed only for white people. He referred to it as "their Constitution," calling it "the best evidence of a white conspiracy to subjugate other peoples." That's the Constitution of the United States. Ellison has spoken favorably, meanwhile, of cop-killer Assata Shakur. He said he was "praying" that Fidel Castro's communist regime in Cuba would not be forced to extradite her back to the United States. As a law student at the University of Minnesota, Ellison wrote a column calling for the creation of a separate black ethno-state. This is the man who is now the second in command in the entire Democratic Party. A more complete catalogue of Ellison's history is can be found in a Saturday post, with numerous links, at the Minnesota-based Powerline blog. The AP's final-paragraph description of antifa as "far-left ... militant(s)" isn't how U.S. law enforcement has described antifa for nearly two years, a period which includes the final nine months of Democrat Barack Obama's presidency. The correct term: "domestic terrorists." Additionally, it's already been shown that antifa violently targets far more than "neo-Nazis and white supremacists." It's almost impossible not to believe that AP's objectives in its Thursday dispatch were to cover up Ellison's true positions as much as possible, and to get its subscribing print, online, radio and TV outlets to look over its report and decide that it wasn't worth relaying to their readers, listeners, and viewers. 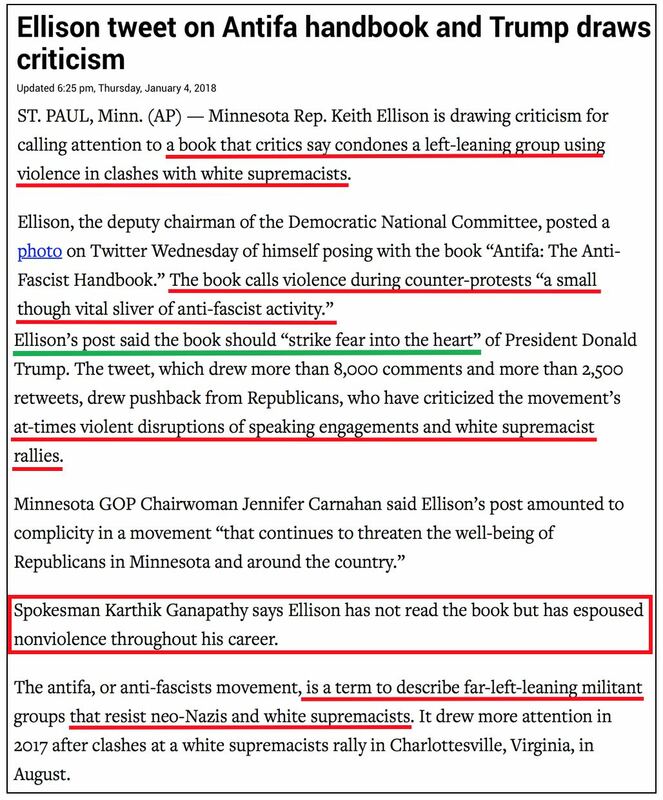 Not that it would ever happen, but if Republican National Committee Chair Ronna Romney McDowell, Co-Chair Bob Paduchik, any elected representative, or even anyone on an elected representative’s staff had tweeted a de facto endorsement of a violent far-right group at 3:48 p.m. yesterday, as Keith Ellison did with the far-left antifa movement, the establishment press would have covered it on Wednesday’s Big Three evening news programs, and it would have been a cable-news obsession for days.